Price: £3.19 (incl VAT) Sorry, this product is no longer available. Olbas for children 10ml a decongestant inhalant. Klear-vol Capsules containing soothing natural essential oil vapours to promote easier breathing. Natural vapours help clear a blocked nose. Contains Pine, Cinnamon and Menthol. Suitable for babies aged 3+ months. Helps aid a restful nights sleep. A blocked nose can make it hard for your baby to get a proper night's sleep which can affect both them and you. 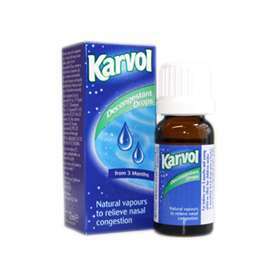 These drops contain natural vapours which act as a gentle decongestant. For babies over 3 months and young children: Put 6 drops onto a handkerchief secured near to, but out of reach of, the child. For older children and adults: For relief during the night, put 6 drops onto bedding or a handkerchief. For relief during the day, put 6 drops onto a handkerchief or tissue or into a pint of hot water and inhale freely. Take care when using hot water. Do not put the drops directly into the mouth or nose. If swallowed accidentally seek medical advice straight away. Side effects are not expected but consult your doctor if anything unusual happens. Levomenthol Ph. Eur. 7.9, Thymol Ph. Eur. 0.7, Chlorobutanol Ph. Eur. 0.5, Terpineol B.P. 14.8, Pumilio Pine Oil 22.9, Pine Oil Sylvestris 2.0, Cinnamon Oil, Triacetin, Polysorbate 80, PEG-20 Stearate and Macrogol. Product code: KAR35J Price: £3.19 (incl VAT) Sorry, this product is no longer available.